The Northrop Grumman Antares rocket carrying the Cygnus NG-10 cargo ship stands atop Pad-0A of NASA's Wallops Flight Facility on Wallops Island, Virginia. It is scheduled to launch on Nov. 16, 2018. The launch of a Northrop Grumman rocket carrying NASA's next cargo flight to the International Space Station has been delayed at least one day to Friday (Nov. 15) due to bad weather expected to pummel the mission's seaside launch site in Virginia. 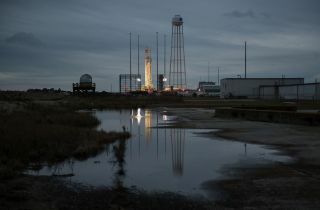 A Northrop Grumman Antares rocket was scheduled to launch an uncrewed Cygnus cargo ship early Thursday, but forecasts predicted a 90-percent chance that bad weather would prevent the flight, NASA officials said today (Nov. 14). The launch is now scheduled for early Friday at 4:23 a.m. EST (0923 GMT). "We have a rocket that's ready to go, a spacecraft that's ready to go, but as most of you have heard, the weather is going to require a 24-hour delay," said Joel Montalbano, NASA's deputy program manager for the International Space Station, in a prelaunch briefing today. Thick, low clouds and stormy weather, including lightning, are main concerns for the launch, NASA officials said. Stormy seas could also pose a hazard to launch support personnel in ships offshore, they added. Weather conditions for launch improve on Friday, with forecasts predicting a 65-percent chance of good weather for the flight. By Saturday, those good-weather odds increase to more than a 95-percent chance of good conditions. The one-day launch delay for Antares and Cygnus is setting up a traffic jam of sorts at the International Space Station. About seven hours after the Cygnus launch, a Russian Soyuz rocket is scheduled to launch another robotic cargo ship, called Progress 71, to the station at 1:14 p.m. EST (1814 GMT) from Baikonur Cosmodrome in Kazakhstan. Like Cygnus, that cargo ship is also scheduled to arrive at the space station on Sunday. Progress vehicles can dock themselves at the space station, while Cygnus spacecraft must be captured by astronauts using a robotic arm. Having two different cargo ships arrive at the space station on the same day will lead to a busy time for station astronauts, but Montalbano said there is ample room in the crew's schedule for both arrivals. "We've talked to the crew about it," Montalbano said. "As far as scheduling, because they're 19 hours apart we don't see any issues." The double arrival will require some adjustments to the station crew's work schedule, but nothing major, he added. The station's Expedition 57 crew is down two people after a Russian Soyuz rocket carrying two crewmates failed to reach orbit in October. The two crewmembers on that flight, NASA astronaut Nick Hague and Russian cosmonaut Alexey Ovchinin, made an emergency landing and were unharmed. Russia's space agency, Roscosmos, has traced the launch abort to a faulty sensor. A new Soyuz rocket will launch three more Expedition 57 crewmembers to the space station on Dec. 3. You can watch Northrop Grumman's Antares rocket launch live here, beginning at 4:15 a.m. EST (0915 GMT), courtesy of NASA TV.